Set against the backdrop of the 1980s California punk scene, Love You Like Suicide explores the dark side of growing up. Author Jo Treggiari writes frankly about a period in her youth when she was addicted to drugs and living in a derelict neighbourhood. After a near-fatal accident, Jo is determined to clean up and start a fresh, new life. But there’s one thing she can’t leave behind: a tender friendship, on the brink of being lost forever. Love You Like Suicide is a gritty, true account of an adolescent who struggles against the odds to make a better life for herself. 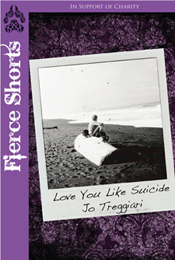 Love You Like Suicide by Jo Treggiari is a Fierce Short – a creative non-fiction piece published through Fierce Ink Press in which twenty percent of all proceeds from sales will go to Heartwood Centre in Halifax. Each Fierce Short author choose their own charity. Though told in the format of a fictional narrative, Love You Like Suicide is non-fiction, a fact which makes the story even more powerful. Detailing a rough and gritty look at a time in the author’s teen years when she was addicted to drugs, this short will at once break your heart and give you hope. Though the circumstances that lead to a life change are not ones to wish for – a near-fatal accident and a tragic death – the creative short still presents a sense of strength and determination in the narrator in regards to living her life differently. Love You Like Suicide is an incredibly well-written, creative non-fiction piece that shows some of the tougher sides of growing up, loving, and learning. 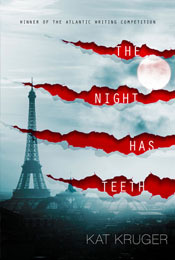 Posted in Blog Tour, Book Reviews, YA Fiction - paranormal	by Cait H.
The Night Has Teeth by Kat Kruger is a captivating and and suspenseful journey through werewolf lore, the streets of France and more than a little bit of mad science. Right away, the prologue wrenches you into the story and keeps you interested. A primary (kindergarten) kid who bites another kid hard enough to draw blood? You have my attention! After that incident, Connor is sent to a French private school where he remains on the outskirts of school social life. It’s not until he receives a scholarship to a school in France that his life gets more interesting than he ever wanted thanks to some Canadian army brats, Madison and Josh, and his host family who don’t look old enough to play parents, really (Amara and Arden – and can I just say, I love their names). But Connor is a sensible sort, and doesn’t let all the ensuing crazyness go to his head – he doesn’t panic (well, a little bit, but who wouldn’t) when he finds out there are werewolves running around France, and indeed, the world, and he doesn’t blindly follow the instructions and wants of any of the wolves out to ensnare him. The only fault I had with Connor is that he doesn’t pester for information enough. He says he wants to know what’s going on, but then keeps letting himself be distracted or put off the question. If he’d been a bit more stubborn, he probably would have had answers sooner (but then we wouldn’t have had a book =P). There is a really neat distinction and lore surrounding Kat Kruger’s werewolves; they are either born, or bitten. Born wolves are those that turn into actual wolves, while people who are bitten turn into the wolfman type creature from movies. And that’s where the mad science comes into play! The antagonist of the story, Henri Boguet, is a bitten werewolf searching for a way to find a cure for those people who are bitten, but of course he has ulterior motives and secret plans that will not be good for the born werewolf population. Connor is wanted by both Boguet and the born werewolves, but he has no idea why and no one will tell him. His journey for answers and trying to stop Boguet drags the reader through the story, not wanting to put the book down because the action, mystery and teen angst (does Madison like Connor or not?) never stops, and you need to know how it ends! The Night Has Teeth by Kat Kruger is an awesome beginning to a series. The writing is wonderfully descriptive in both character and setting (love that it takes place in France), and Connor’s emotions – confusion, as well as determination and fear – shine through clearly. While there are moments of reader frustration as the book continues and Connor still doesn’t know why everyone seems to want him, questions do get answered near the end and the final scenes and revelations are intense. The Night Has Teeth is one of those books where Connor can’t trust anyone but himself, and he has good reason not to. It’s easy to see why this book won the 34th Atlantic Writing Competition, and I’m excited to see where the story goes in book two! e-ARC received from Fierce Ink Press in exchange for my honest review. Thank you!